Laser vision correction with LASIK can be a life-changing experience. By permanently correcting visual errors, LASIK reduces or eliminates your need for glasses and contact lenses. Focus improves, details sharpen and everyday tasks (like reading a text or glancing at the newspaper headlines) are more convenient. 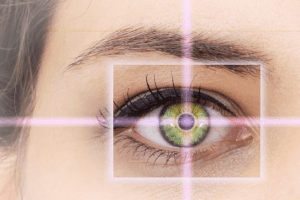 People seeking LASIK in Scottsdale and the surrounding Phoenix areas trust Dr. Jay Schwartz and the team at Schwartz Laser Eye Center for their vision correction surgery. LASIK corrects nearsightedness, farsightedness and astigmatism, which are refractive errors caused by irregularly shaped or curved corneas. The goal of LASIK is to reshape the cornea so it alters the way light enters the eye and vision becomes sharper and more focused. The traditional LASIK procedure involves several steps. To prepare the eye for treatment, a flap is first created on the surface of the cornea. The flap is gently folded back to allow access to the underlying corneal tissue. Then, an excimer laser is used to carefully reshape the cornea to the desired curvature. Finally, the flap is repositioned over the eye, and it seals itself. iLASIK is a customized approach to LASIK. It customizes treatment based on a map of your eye’s unique structures and imperfections. iLASIK is blade-free, meaning that lasers are used during the two crucial steps of the procedure: to create the corneal flap in preparation of treatment and to reshape the cornea into the desired curvature. Epi-LASIK involves using a special surgical instrument to separate the layer of cells on the outermost portion of the eye, making a flap similar to a traditional LASIK flap. The underlying corneal tissue is treated and, afterward, the epithelium flap is restored to its original position. Photorefractive keratectomy, or PRK, is similar to LASIK except that it does not involve the creation of the corneal flap. Instead, the outer layer of the eye (called the epithelial layer) is manually removed to reveal the underlying corneal tissue. Eventually, the epithelial layer grows back naturally without affecting the newly shaped cornea. Clear lens extraction is a laser vision correction alternative usually suitable for individuals over the age of 40. During the procedure, the eye’s natural lens is removed and replaced with an artificial lens implant. There are several types of intraocular lenses (IOLs) that can be used, including multifocal, phakic and accommodating IOLs. Our team will help you select the IOL that is right for your individual needs. Another laser vision correction alternative is the Visian ICL. Unlike a conventional contact lens that can be easily removed for sleeping and cleaning, the Visian ICL is surgically implanted in the eye to correct vision. The implantable contact lens is biocompatible and designed to last a lifetime. With the iFS™ Advanced Femtosecond Laser, the flap created for LASIK surgery is completed without the traditional use of a blade. Moreover, the 5th generation iFS™ Advanced Femtosecond Laser is capable of creating a corneal flap in less than 10 seconds. The newest iFS also creates a unique inverted bevel-inside cut angle to provide a safer and stronger flap. While the standard method of flap creation has been reliable and quite safe, the use of the newest iFS Advanced Femtosecond Laser gives Dr. Schwartz the ability to make a thinner, finer flap that leaves more corneal tissue for the correction of higher-degree refractive errors. This newest iFS™ Femtosecond laser may enable patients that were deemed not great candidates to participate in this amazing surgery. Experienced surgeons agree that this technique delivers less distortion and better vision postoperatively and now with the newest iFS a safer more reliable procedure can be achieved. A micro-thin flap that looks much like a contact lens is created from the outer layer of the cornea using IntraLase® iFS, a safe, accurate, and predictable computer-controlled laser beam. This step takes a matter of seconds. The flap is then folded back, and an excimer laser is used to reshape the inner cornea gently and precisely. This step takes about one minute to complete. After treatment with the excimer laser, the corneal flap is placed back into its original position and eye drops are applied to the eye. The corneal flap will naturally seal itself within minutes, although it is important to refrain from rubbing your eyes at this time. Many patients do not realize that the eye is an imperfect optical system. As light rays from distant objects pass through the individual optical components of the eye, they are subject to the distorting effects of the imperfections found in the cornea and the crystalline lens. These imperfections are referred to as “aberrations.” The vast majority — 90 percent or more — of these aberrations create common refractive errors, such as nearsightedness, farsightedness, and astigmatism, that can be treated by optical devices, such as glasses and contact lenses, or by laser vision correction using the conventional LASIK, PRK, or LASEK methods. The remaining 10 percent of optical aberrations create images that are altered by chromatic aberration, spherical aberration, diffraction, curvature of field, coma, trefoils, and quadrifoils, all of which are collectively known as “higher order aberrations.” These higher order aberrations only occur in a visually significant manner in 10 to 15 percent of the general population. When they do occur, they are entirely unique to each particular patient — much like a fingerprint. For these patients, the use of a wavefront-guided laser technique to reshape the surface of the cornea in a completely customized fashion may be the best treatment option. Achieving a customized corneal shaping requires measuring the higher order optical aberrations using a wavefront analysis system called an aberrometer and then digitally interfacing it with a laser. This analysis system then uses high-speed computerized control to direct the delivery of a very tiny beam of laser energy across the cornea, giving it a smooth, uniform shape free of aberrations. 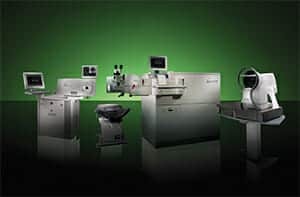 Our practice is proud to feature the VISX CustomVue™ wavefront system for individualized laser eye-surgery treatments. The VISX CustomVue™ wavefront system provides an extremely precise level of measurement and correction that was never before possible, setting a new standard in laser vision correction. The system allows the surgeon to see aberrations on the eye clearly and map them on a computer using WaveScan®, a technology so powerful that it was originally developed to create distortion-free pictures of distant objects in high-powered telescopes. WaveScan® records the unique “fingerprint” of the eye and is 25 percent more precise than traditional refractive-error-measurement methods used for glasses and contact lenses. Because of its precision, WaveScan® can measure more than just nearsightedness, farsightedness, and astigmatism; the system can also accurately measure more detailed imperfections on the eye. Information from WaveScan® is transferred directly to the VISX Star S4™ laser so that it can perform a personalized LASIK eye surgery treatment. Because each person’s vision is unique, no two VISX CustomVue™ surgeries are exactly alike. This LASIK treatment process also uses iris registration technology to align the cornea with the machine for the greatest accuracy. Patients, specifically those with nearsightedness and astigmatism, can benefit from VISX CustomVue™ wavefront technology because of its ability to deliver significantly clearer vision than is possible with glasses or contact lenses. Vision improves significantly immediately after treatment and continues to improve over the next few days. Many patients enjoy being able to see 20/20, and sometimes even better, after VISX CustomVue™ treatment. The iDesign Advanced WaveScan Studio System generates a high-definition scan of the eye, measuring and mapping unique irregularities that affect vision. This information is then used to personalize LASIK treatment and address the specific visual concerns of the patients. The system’s sensor technology is based on an earlier discovery that NASA used to help develop a telescope that will be used in the future to transmit images from space back to Earth. The day of LASIK surgery is exciting and busy. To help you feel prepared and ready for treatment, we compiled a guide to the day of LASIK surgery. The information explains what to expect before, during and after the procedure. We understand that LASIK concepts can seem complex, and we receive a lot of questions about candidacy, benefits, risks and more. We have put together a section of frequently asked questions about LASIK as a resource to which you can refer. And, we always recommend you come in for your free LASIK evaluation to have your questions answered by the surgeon. To speak with Dr. Schwartz about LASIK and whether it is right for your personal vision correction needs, please contact us and request a consultation. Call 480-483-EYES (3937) or 888-553-EYES today.